Born one of a set of quadruplets, Karl Courtney was always the black sheep of the family. Donning a cutlass and pirate outfit, Karl becomes Captain Stingaree. In his first outing, Captain Stingaree attempts to uncover Batman's secret identity. Somehow Stingaree has become convinced that his three brothers are actually Batman. Batman approaches the Courtney brothers, asking them to pose as Batman and act as bait for Stingaree. This allows the real Batman and the Flash to capture Captain Stingaree. In Secret Society of Super-Villains #6 (April 1977), Captain Stingaree joins the Society. Teaming up with Captain Cold and Captain Boomerang I, the three captains went on a crime spree kidnapping other captains to show supremacy over air, land and sea, before they are taken down by Captain Comet and Black Canary II. 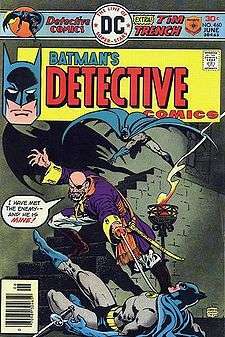 In Detective Comics #526, Captain Stingaree meets at an old theater with other Bat-Villains. Talia is branded a traitor. While Talia escapes, Captain Stingaree is accidentally frozen by Mr. Freeze. This is his last pre-Crisis appearance. In Justice League of America #2 (November 2006), it is revealed that Captain Stingaree is gay, and is in a secret relationship with the Cavalier (Mortimer Drake). Black Lightning uses this fact to leverage information out of the closeted Cavalier. Both Captain Stingaree and Cavalier are killed during a fight with the Secret Six (although Cavalier, whose back was broken by Bane, may have survived). Captain Stingaree has no superpowers but is a skilled swordsman.